We have made a turn in the seasons. The summer is coming to a close and, as usual, the horror titles have begun flooding the Blu-ray Shopping Bag. It really is like Christmas for the horror fans when August sets in. Horror fans relish this time from August to October because it is when all the distributors release and re-release our favorite titles. Today we kick off August with a doozie that is a science fiction horror thriller. 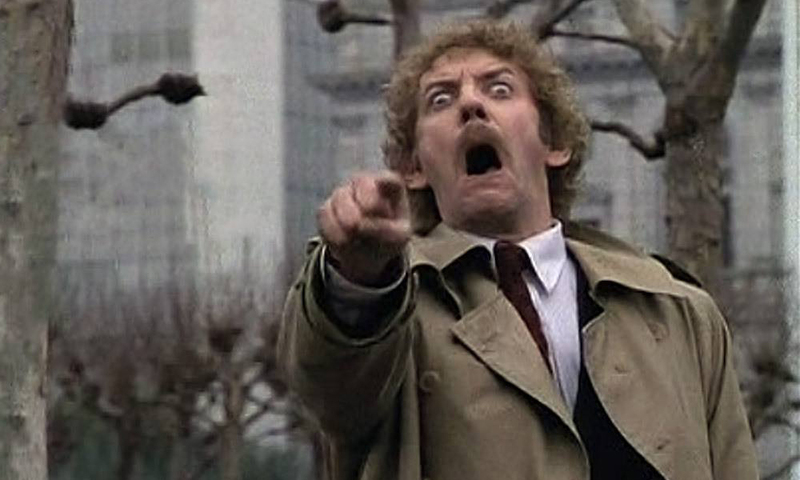 Today we enjoy Scream Factory’s collector’s edition release of Invasion of the Body Snatchers (1978). Science Fiction films can often feel dated. The story here, though based on the fear of a communist takeover, can easily be seen as a simple alien invasion story. The new 2K restoration (from the interpositive) allows the film to look as if it is period piece. In fact, it weren’t for the film’s brilliant cast looking as young as they do, you would think it was shot yesterday. It’s this cast that makes this film so accessible to today’s audience. The characters are played by actors whom we recognize from so many other classic films. Thus we immediately feel invested in them. The hero of our tale is Matthew, played by Donald Sutherland. Not really a Sci-Fi genre star, until his recent turn as President Snow in The Hunger Games, but a face we recognize nonetheless. Sutherland was having a stellar year in 1978, because Animal House was huge hit just a few months earlier. The brilliance of being able to look back though is we see Buffy the Vampire Slayer’s first mentor, Merrick, leading the charge for humanity. At the time, Veronica Cartwright was still a year away from appearing in Ridley Scott’s Alien. However, the actress has a pedigree that stretches all the way back to Alfred Hitchcock’s The Birds. Her portrayal here of the hysterical Nancy would become her trademark character in genre titles such as The X-Files and even another Body Snatchers remake, Invasion. Jeff Goldblum is the odd actor in hindsight. He was still relatively unknown and not really an actor who would hold a lead role until Transylvania 6-5000. In looking back from now to then, Goldblum is a Science Fiction staple with such films as The Fly, Independence Day, and The Adventures of Buckaroo Banzai Across the 8th Dimension. That neurotic untrusting character type, which he is famous for, was birthed in this very film. Then we come to Leonard Nimoy. He was on the verge of playing Spock again and a hero to Sci-Fi fans. It is not without great irony that the most trusted face in the entire picture is the one person who uses logic to debunk all the theories about these impersonators. Is Spock logical to a fault? Could he be the lynch pin in saving humanity or the axe that kills it? The mix of these actors helps this familiar and paranoid story feel fresh. Sutherland is an unlikely hero. He’s nerdy looking and works for the health department, but it is his scenes with love interest and co-worker, Elizabeth (Brooke Adams), that rallies you to the cause. As the audience, we have the perspective of seeing everything unravel and knowing the truth, but we still need to believe it and see the fear of what is happening. Sutherland and Adams take us on that emotional journey. The contradiction of Nimoy’s psychologist, Dr. David Kibner, and Goldblum’s Jack Bellicec is the anchor to the film about invading plants. We need the believer and witnesses that the threat is real. The plausibility comes from Dr. Kibner relating these strange occurrences with marital discontent. His fear is that the very system of marriage in society is failing, not little green men. It’s a great combination that instills a horror based in reality. There are not many sequels or remakes that live up to their originals. Phillip Kaufman’s 1978 remake of Don Siegel’s cold war sci-fi thriller is such a film. Much like the original film, we have aliens impersonating human beings and erasing their individuality. In 1956, it played on the country’s fear of Communism. Sadly, in 1978, our fear of the red menace was still very much the same. This is not a new story and it keeps getting retold with each generation. The results vary from time to time, but this one stands high on the list. It has the right combination of actors that has allowed it to endure.